Some domestic animals are thought to be skilled at social communication with humans due to the process of domestication. Horses, being in close relationship with humans, similar to dogs, might be skilled at communication with humans. Previous studies have indicated that they are sensitive to bodily signals and the attentional state of humans; however, there are few studies that investigate communication with humans and responses to the knowledge state of humans. Our first question was whether and how horses send signals to their potentially helpful but ignorant caretakers in a problem-solving situation where a food item was hidden in a bucket that was accessible only to the caretakers. We then examined whether horses alter their behaviours on the basis of the caretakers’ knowledge of where the food was hidden. We found that horses communicated to their caretakers using visual and tactile signals. The signalling behaviour of the horses significantly increased in conditions where the caretakers had not seen the hiding of the food. 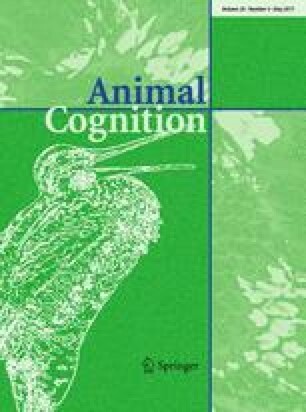 These results suggest that horses alter their communicative behaviour towards humans in accordance with humans’ knowledge state. An erratum to this article is available at http://dx.doi.org/10.1007/s10071-017-1074-x. Special thanks to the students of the equestrian club in Kobe University. We are grateful to Fuki Maehara for her support in our study’s video analysis. We also thank Dr. Shigeto Dobata for his support in the study’s statistical analysis. The study was supported by grants from the Japan Society for the Promotion of Science (KAKENHI Nos. 26118509, 15H01619 and 15H05309 to Shinya Yamamoto). The experimental procedure for the horses was approved by the Institutional Animal Care and Use Committee (Permission number: 27-12-02) and carried out according to the Kobe University Animal Experimentation Regulation. All procedures adhered to the Japanese Act on the Welfare and Management of Animals.